The beach recreation season is finally here! But before you grab your kayak or your swimming gear, it’s important to know the status of your local water bodies before you go. You may remember that a combined sewer system is a wastewater collection system that is designed to collect and convey both sewage from homes & businesses and storm water through a single pipe. A combined sewer overflow (CSO) may result should this single pipe be overwhelmed during rain events and system capacity is exceeded. During a CSO, untreated sewage that would normally be flowing to a treatment plant instead flows directly out from where the outfall pipe is located, discharging to a nearby water body. Although the solution to this outdated infrastructure is ultimately its replacement, this will take time and money to do so. In fact, the U.S. EPA estimates the cost of doing so is likely $298 billion nationwide—$23.3 billion in the Great Lakes basin alone. So what can you do right now? Be informed! According to EPA’s 9 Minimum Controls for CSOs, it is mandatory for municipalities to provide public notification to ensure adequate notification of CSO occurrences and CSO impacts. 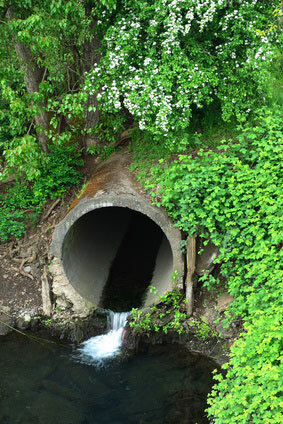 If you would like to receive notification from a community that has an outfall, please contact the community’s sanitary district for more information. Municipalities will put you on their list for notification and/or direct you to their community forum where they may post this information publically. Notification methods may differ among communities. Northwest Indiana municipalities within the Lake Michigan Water that have CSO outfalls include: Chesterton, Crown Point, East Chicago, Gary, Hammond, Michigan City, and Valparaiso. In total, there are 43 active outfalls capable of discharging to waterways leading to southern Lake Michigan. Only 3 of these outfalls are treated if overflowing. The remaining may convey partially or completely untreated wastewater during or following a heavy rain event. Indiana has more CSO communities that drain to Lake Michigan than any other state. There are other communities not listed above that also discharge to Lake Michigan, however do so through tributaries that flow through Michigan and reach the lake to the east. Many of these communities are already working to update combined sewer infrastructure to reduce, and ultimately eliminate, CSOs. But until this lengthy process is completed in the years to come, it is best to be aware. For more information regarding CSO communities, please contact Natalie Johnson, Urban Waters Coordinator, at Natalie@savedunes.org. Remember: A good rule of thumb is to not enter local water bodies for 48 hours after a rain event. Also, the Indiana Department of Environmental Management (IDEM) recommends beach goers visit www.extranet.idem.in.gov/beachguard for the latest on beach closures. Because it may take longer than 24 hours before a closure is posted, Save the Dunes recommends signing up for public notification of CSO communities in addition to visiting IDEM’s Beach Guard website. Knowing before you go will guarantee you a safe and fun-filled summer.